Codcub ~ Unique modular furniture designed to grow with your child! Home » Codcub ~ Unique modular furniture designed to grow with your child! 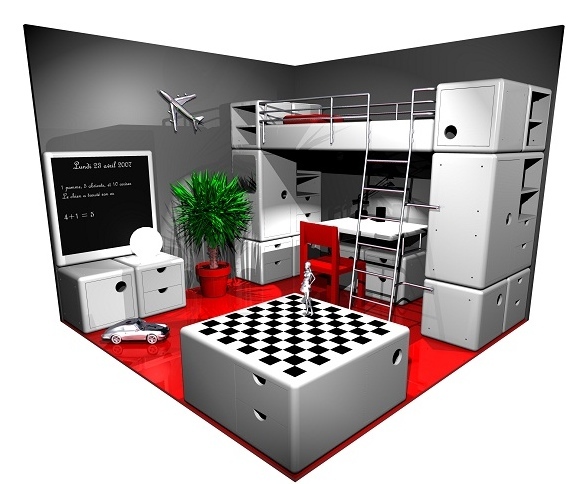 Codcub offers the perfect solution to countless room makeovers as kids grow and their tastes change. This unique French furniture offers a modular structure so that pieces can be added and completely rearranged as the child grows. Codcub combinations are limited only by the child’s imagination! Individual pieces included cube shaped cupboards, shelves and drawers units, all with identical dimensions to make stacking and combining easy. Additionally there is a larger wardrobe, games table, blackboard, single bed spring, desk as well as a ladder and guard rail to create a raised bed. Constructed with rounded corners from lacquered reconstituted wood, sleek and modern Codcub furniture pieces are made to last through a number of rearrangements and life with a child.